This project came out of the 2015 replacement of Sam Chatmon's marker in Hollandale, but it also grew out of the failed efforts of other researchers. In the early 2000s, a Greenville cemetery investigator showed an Ole Miss master's candidate to the burial ground in hopes of locating a marker. The two men searched the burial ground, yet found nothing, and left unsatisfied. In the early 2010s, an enthusiast from Michigan traveled to Nitta Yuma to look for his headstone. He also came up empty. In a later article, the hapless northerner claimed to be searching for the folks who take care of the cemetery. The Mt. Zion Memorial Fund picked up where logic eluded him. We knocked on the door of the home in front of the cemetery, which turned out to be the home of the landowners sister. Roy Schilling, of Hollandale, lord of the Sam Chatmon Blues Festival, played a key role in pitching the project to Henry Vick Phelps III, the patriarch of Nitta Yuma. 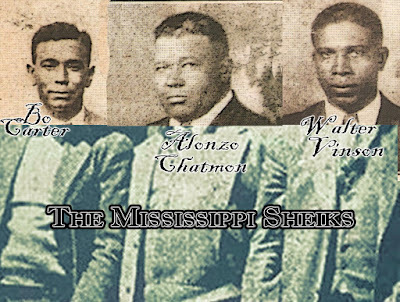 Click here to read Elaine Hughes account of Bo Carter performing at her house in Vicksburg. The stone was ordered at the end of May. At the beginning of July, we received word that it would not be done in time for the dedication. Thus, I cancelled the element of the marker that proved time consuming for the original monument company. I contacted a local engraver in plenty of time to get the black granite engraving of Bo’s National done in time, but the original monument company did not forward the specs for the engraving until three weeks later, despite two or three phone calls each week and several promises to forward the information. The local man had a crude version completed on the day of the dedication, but we decided to take a little time to get it right. The marker, after all, looks wonderful without it. 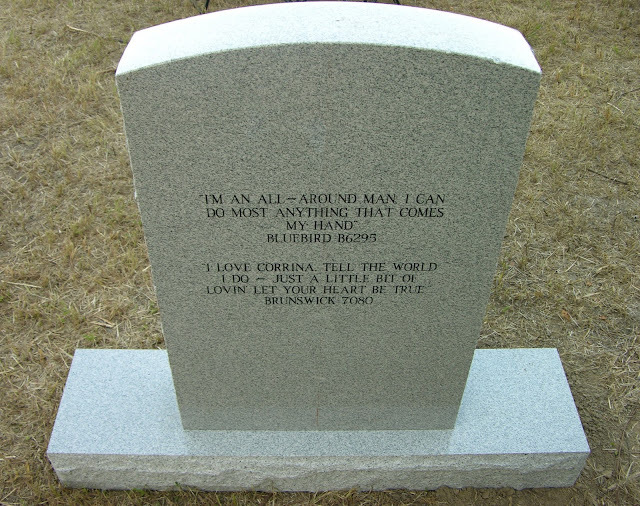 The back of the marker contains two single lines of lyrics from Bluebird B6295 ("All-Around Man") and Brunswick 7080 ("Corinne Corinna"). The inscription on the front came out of the fundraising campaign for the marker. Along with their donations, supporters were encouraged to write some thoughts down as well. 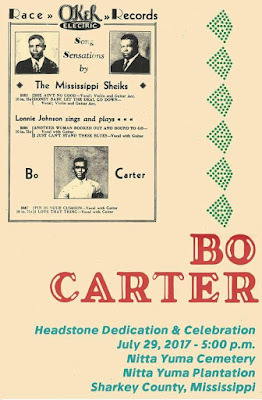 One student of Bo Carter's complex guitar work wrote the engraved text and made an online donation. He did not recall writing it at the dedication, however. 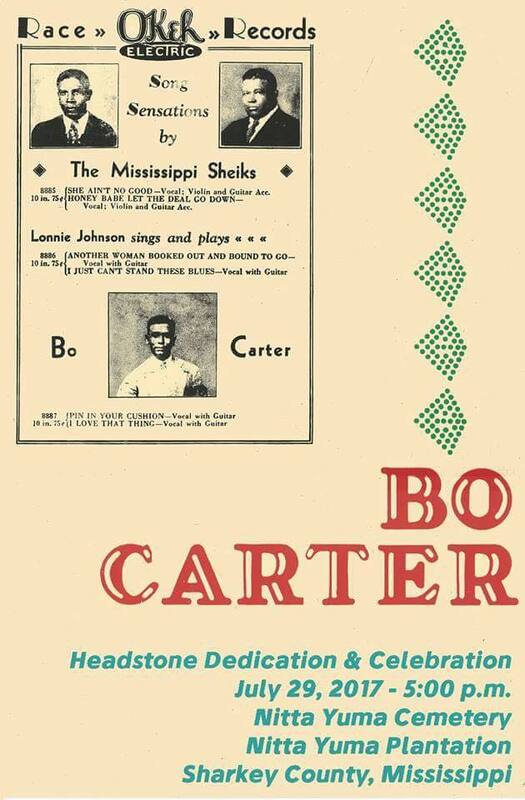 An estimated seventy people attended the dedication of Bo Carter's headstone in Nitta Yuma, MS, including friends from California, Washington, Michigan, Georgia and Mississippi. Nitta Yuma is a hamlet of maybe twenty inhabitants, on an old plantation in Sharkey County, Nitta Yuma Cemetery sits tucked into the corner of a huge field of corn and flush with Deer Creek., and we all drove through dusty paths to get there. DeWayne Moore, director of Mt Zion Memorial Fund, which erected the monument and organized the dedication, spoke about the marker of Sam Chatmon in nearby Hollandale, and how working with locals on that project inspired this project. He also stated that the monument would also serve to protect the cemetery from agricultural encroachment, as it sits on the edge of a large corn field. Next to speak was Henry Vick Phelps III, owner of the plantation, who cooperated with the Mt. Zion Memorial Fund and granted a perpetual and public easement to the cemetery and hosted the event. Mr. Floyd wanted his lawyer, Barry Shrum, to say a few words in the absence of Patrick Leblanc, a Greenville native and friend who has been helping to recover royalties made form from Eric Clapton's "Alberta, Alberta," which is actually a reworded cover of Bo Carter's 1928 classic "Corrine Corrina." Alan Orlicek, the new engraver for the black granite, came up and helped unveil the headstone. Everyone was impressed with the marker and rushed to look at it and pose for pictures. The mayor of Rolling Fork had asked to say a few words in the spot on the program set aside for special guests, but about fifteen minutes after the unveiling, Cheseborough grabbed the National and started playing and singing, "I Want You to Know." The crowd quieted down and the mayor looked over at me. The crowd applauded at the end of the tune, and I didn’t want to interrupt at that point. I’m glad to hear it worked out well. I apologize to the mayor. Cheseborough spoke and invited Bill Gandy, owner of Bo Carter's guitar, to speak as well, asking him to tell the story of how he happened to acquire it and later discover its history. 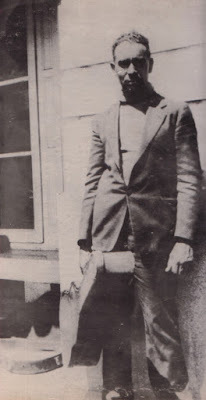 Beforehand, I had spoken to Gandy and he told me about bringing Kenny Brown (Gandy's neighbor, companion on the drive from Potts Camp to Nitta Yuma, and longtime R.L. Burnside sideman) to the event. Brown and I had recently discussed the headstone dedication of Joe Calicott back in the 1990s, and I intentionally left them off the program as a pleasant surprise to all those in attendance. Kenny Brown did not fail to wow the crowd using his metal slide on the National of Bo Carter and playing a tune by Muddy Waters. 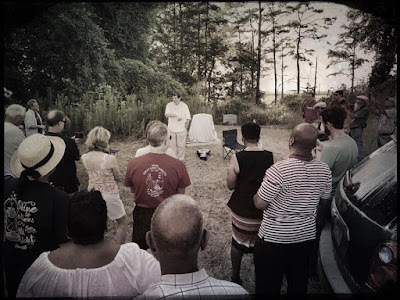 Then we all trucked out of the cemetery, up the hill to Nitta Yuma proper, for a reception in the chapel, where Andy Cohen was sitting up front playing for a dozen or so people. He took turns doing songs with Steve Cheseborough, who stuck rigidly to Bo Carter while Andy did Rev Gary Davis and Lonnie Johnson in his own style. When Miles Floyd and his family came in Cheseborough played "All Around Man," Miles’ favorite Bo Carter song. He loved it. He even had it engraved on the back of the marker. Another highlight was meeting Leslie Miller who brought two photos of Bo Carter playing for her and other local children in 1956! He was playing the National. He wore coveralls in one picture, as if he had come from work as a mechanic. In the other he is dressed up and accompanied by a fiddler. I asked about the repertoire. She said he would start with "Tennessee Waltz," saying his other songs were too dirty for children! But he also played other songs which she doesn't remember. She said it was a frequent event, his performances in the area. She is going to talk to a woman in her 90s who might remember more about it, and get back to me with any info.